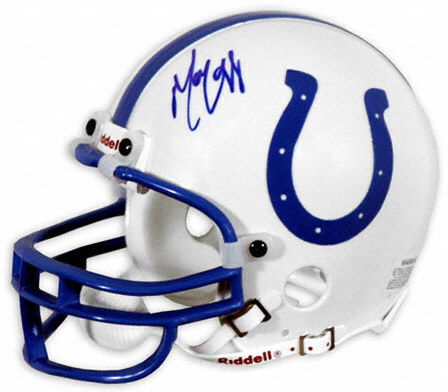 Marvin Harrison spent his entire 13-year NFL career with the Indianapolis Colts where he was Peyton Manning's favorite target for several seasons. 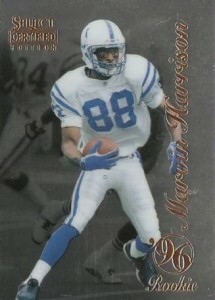 Marvin Harrison cards have room for growth in terms of value. He is a lock to be inducted into the Hall of Fame when he becomes eligible. 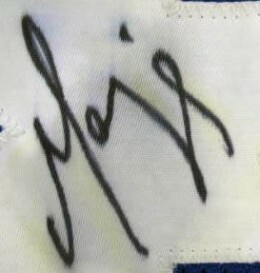 His football cards and autographed memorabilia will almost certainly see an increase in value when that day comes. 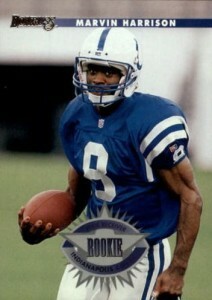 Marvin Harrison was the 19th overall pick in the 1996 NFL Draft. All of his rookie cards are from that year. He has 29 in total and all are very affordable. None of his rookie cards are autographed, numbered or contain memorabilia. Harrison's first certified autograph cards were issued in his first year but are not considered to be rookie cards. This is because they're inserts and not base cards. Harrison has an autograph in 1996 Leaf Collector's Edition that has a stated print run of 2,000. Another autograph is in 1996 Skybox Impact Rookies. 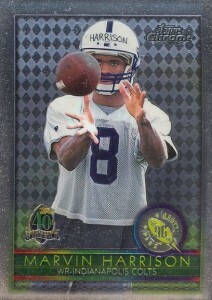 Harrison's first memorabilia cards were issued in 1999 Leaf Certified. He has two cards in the product. One has a swatch of jersey material. It is not serial numbered but has a known print run of 300 copies. The other card is a one-of-one NFL Shield Logo Patch card. Marvin Harrison's autographed memorabilia is readily available on the secondary market. Prices are commiserate with a player of his future Hall of Fame caliber. 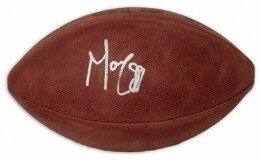 Footballs and photographs are the most common items he signs. Jerseys and helmets are also very popular but can be expensive. 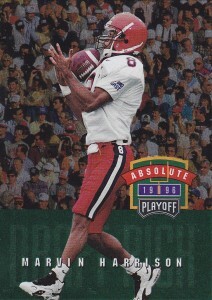 This is, arguably, Harrison's most popular rookie card. 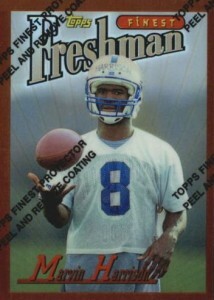 It is one of his most commonly submitted rookie cards for professional grading. High-grade examples carry a significant premium, often into the four figures. The Finest brand has been a collector favorite for years. When first released, collectors didn't know whether to peel off the protective film or leave it affixed to the card. Examples submitted for professional grading, that still have the film, almost always recieve higher grades than an unprotected card in similar condition. The lesson here is, don't peel, especially now that that cards aren't exactly new. Harrison's base card in the Topps Chrome set is one of his more affordable premium cards. It does have a Refractor parallel that fetches large sums. The cards are prone to curving and should be stored in a rigid top-loader. 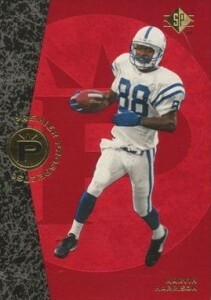 Reggie Wayne Marvin Harrison Short Print 2 Card Lot! Colts Legends!! 2007 SPX WINNING MATERIAL 2 MARVIN HARRISON DUAL PATCH SP 08 10. 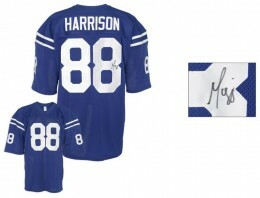 Below you will find examples of what an authentic Marvin Harrison autograph looks like. This can be used as a first point of reference for determining the legitimacy of autograph memorabilia, but is not a substitute for having your items authenticated by a well-respected professional autograph authentication company. Some of the trusted sources within the sports memorabilia market include the following companies: PSA, JSA, Tristar, and Mounted Memories. Click on any of the images below to view full size photos. The entire signature appears to consist of just a few pen strokes. The letters "M" often shows the greatest variance. The above example is the one you will see on most memorabilia items. It starts with a small hook at the the bottom left. It has a loop at the top of the right vertical line. The "a-r" combination looks more like an "o" and upside down "v."
The signature finishes with a bow-like character. 2018 Honors 2016 Limited Football Team trademark sigs Marvin Harrison 1 1 Auto!